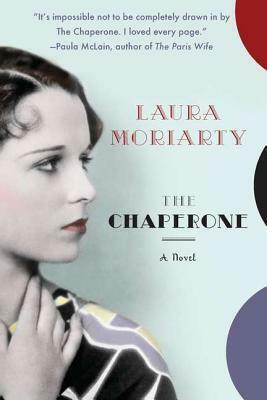 Today marks the publication of Laura Moriarty's The Chaperone (Riverhead). Copies have just arrived, and are now on display at Book Passage! Moriarty's new book is the USA Today #1 Hot Fiction Pick for the summer and an Indie Next List pick, as well as the #1 selection for "Best Book Coming Out This June" in O Magazine. Moriarty, who lives and teaches in Kansas, will be dropping by our store to sign books later this month. Order a copy here. The Chaperone is a terrific, quietly powerful and captivating novel about the woman who chaperoned an irreverent Louise Brooks to New York City in 1922, and the summer that would change them both. Only a few years before becoming a famous actress and an icon for her generation, a fifteen-year-old Louise left Wichita to make it big in New York. Much to her annoyance, she is accompanied by a thirty-six-year-old chaperone who is neither mother nor friend. Cora Carlisle is a complicated but traditional woman with her own reasons for making the trip. Cora has no idea what she’s in for: young Louise, already stunningly beautiful and sporting her famous blunt bangs and black bob, is known for her arrogance and her lack of respect for convention. Ultimately, the five weeks they spend together will change both of their lives. Drawing on the rich history of the 1920s,1930s, and beyond – from the orphan trains to Prohibition, flappers, and the onset of the Great Depression to the burgeoning movement for equal rights and new opportunities for women – Moriarty’s The Chaperone illustrates how rapidly everything, from fashion and values to and hemline and attitudes were changing, and what a profound difference it made for the real life Louise Brooks, the fictional Cora Carlisle, and others like them. Recently, Moriarty answered a few questions about her new book for Book Passage staffer Thomas Gladysz, a big fan of both Louise Brooks and The Chaperone. How did you come to write The Chaperone? How did you come to discover the story of 15 year old Louise Brooks heading off to NY in 1922 with an older chaperone? I was browsing in a bookstore, and I came across the book Flapper by Joshua Zeist. He has a chapter devoted to Louise, and I’d always thought she was compelling. I started reading about her early life, and right there in the bookstore, I learned about the trip with the chaperone. Given what I already knew about Louise – that she was smart, self-directed, and temperamental – I knew this chaperone must have had her work cut out for her. What is it about their story that interests you? I’m always interested in inter-generational tension, and 1922 strikes me as a time when just a twenty-year gap in ages could make such a difference between two people. If the chaperone was 36 in 1922, she would have come of age during a time of corsets and covered ankles. The flappers with their bared knees – and all the changing social mores that fashion represents – would have been hard to get used to. So the chaperone might have been challenged by any forward-thinking adolescent, let alone the already sophisticated Louise Brooks. I was also intrigued by Louise’s complicated personality and story. She was both smart and self-destructive, and I wondered about her sudden disappearance from Hollywood. One thing that impresses me about Louise is how authentic she was – she acted as she felt and she said what she thought. Hollywood wasn’t the right place for her. Did writing The Chaperone involve much research? What were the challenges of writing about two historical figures - one of which we know a good deal about, the other obscure? I did a great deal of research for this book. Researching Louise was actually the easy part – I read her biographies and her autobiography, and I watched her films. I even looked at her old letters to see her handwriting. But I actually had to do more research for the chaperone, Cora, because even though she was invented, I wanted to make her a woman of her time, to make her someone who could have been thirty-six in 1922. But I really liked weaving Cora’s imagined life into the real facts of Louise’s. Were you a fan of Louise Brooks? I knew who she was and I thought she was striking, but I wasn’t a fan until I started reading about her. I’m certainly a fan now. When did you first encounter her? Is there anything you learned about Louise Brooks that surprised you? I don’t remember when I first learned who she was. I know I tried to copy her haircut back in my twenties, and it completely didn’t work on me! But it wasn’t until that day in the bookstore that I started learning about her life. As for surprises, there was an answer Louise gave to a question in her old age that I found really moving. LB fans will know, I think, what I’m alluding to, and I don’t want to ruin it for people who haven’t yet read her biography. But late in life, someone asked the hard and worn-down Louise if she’d ever really loved anyone, and her answer was pretty touching. I wish I could have been a fly on the wall when she was interacting with this person, the one person she could admit she loved. The Chaperone has been described as "the best kind of historical fiction, transporting you to another time and place, but even more importantly delivering a poignant story about people so real, you'll miss and remember them long after you close the book." That is a wow. What's next? Thanks! I really have liked writing historical fiction, and my next novel will be historical as well. I’m just starting the research now . . .
Book Passage customers and fans of Downton Abbey will be thrilled to learn that actress Elizabeth McGovern reads the audio version of The Chaperone, which is due out in July. (Follow the previous link to order a copy). McGovern has also optioned the movie rights - and yes, Cora (her character in Downton Abbey) could end up playing Cora. Want to see more? Check out this video interview with Laura Moriarty from USA Today.